Get real about the amount of glamour you need in your life right now! We’re still all about keeping things simple, but when it comes to gold accessories, bigger is better. 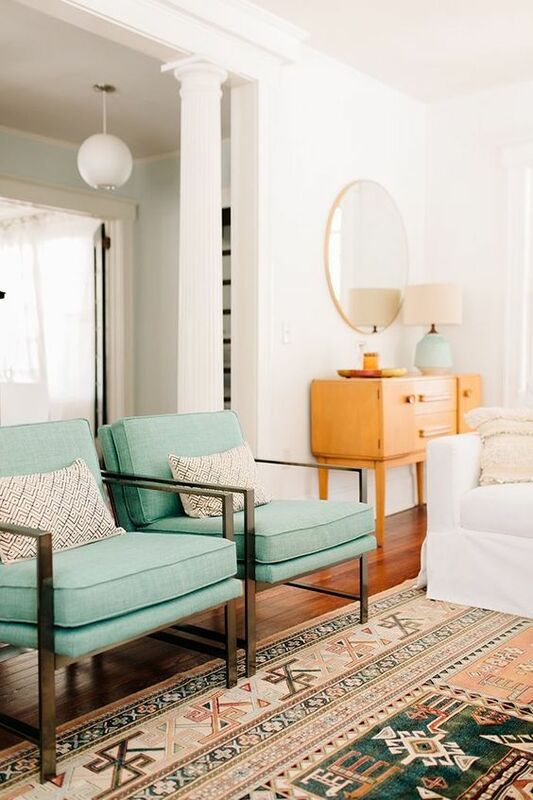 When you’re decorating with a minimal mind frame, the details start to shine a little more. Nothing says minimalism has to stay stuck in modern lines. You can still use the “less is more” idea and be as ornate as you wish! We’ve gotten so used to seeing chrome in bathrooms, but warmer colors work especially well in smaller spaces. 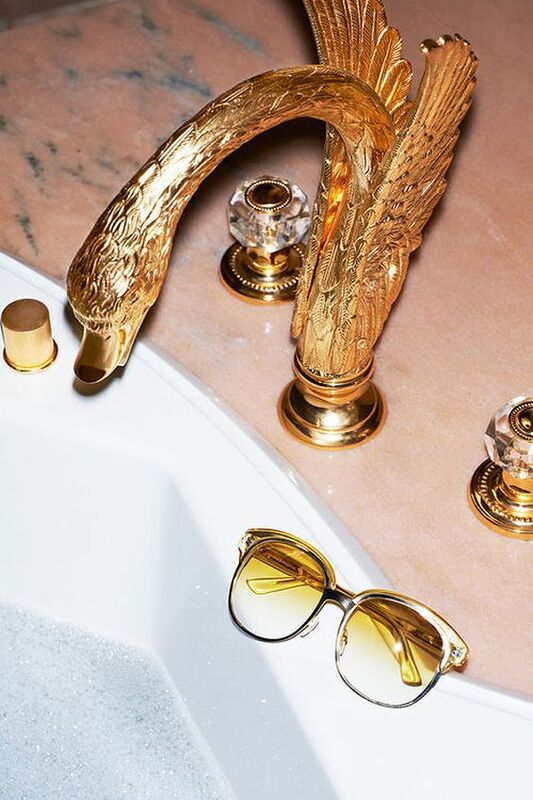 Powder rooms are the perfect places rock some serious gold action. 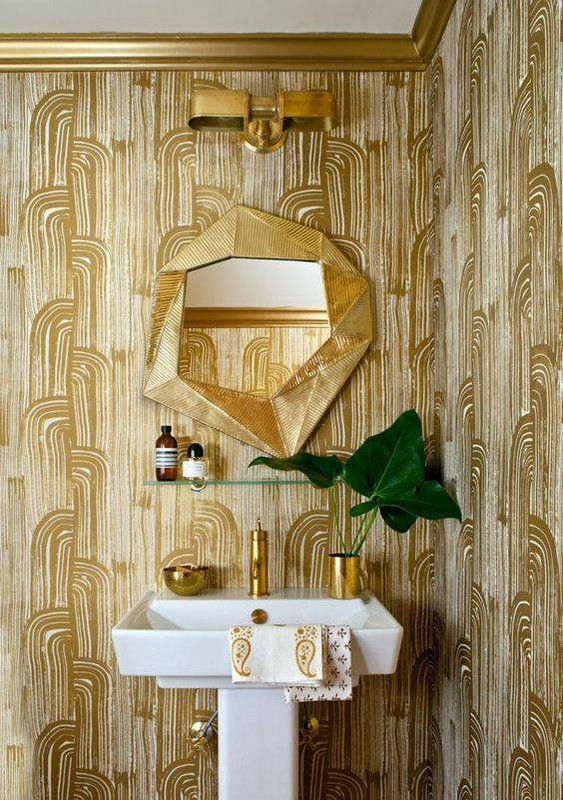 Be sure to review our “Bathroom Beauties” article for more ideas on how to get creative with wallpaper. Super easy with just a little bit of imagination. 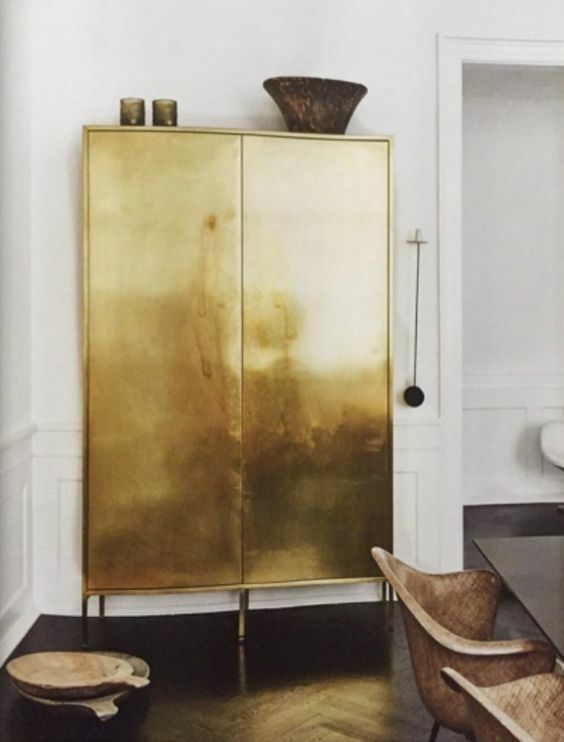 While we are on a natural decor kick, nothing accents natural woods quite like warm metals. If you have a less-than-perfect piece of furniture that needs covering, consider canvasing it with gold paint. It takes something from ho-hum to striking in less than an afternoon’s work. Check out our fun ideas for painted furniture and do drawer fronts or paint-dipped legs. 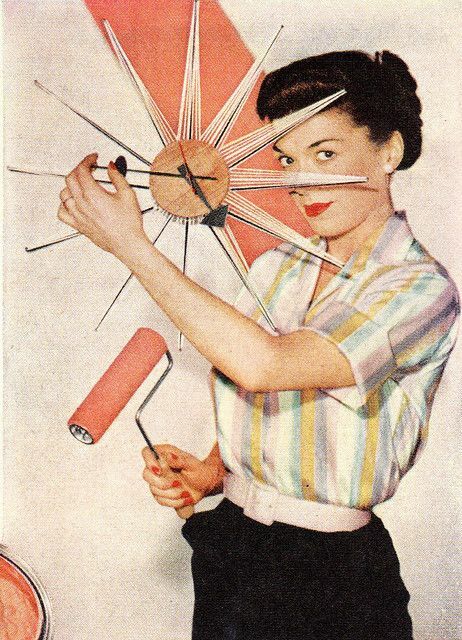 You can upcycle junk into treasure with the right kind of makeover tactics. Feeling stuck in a terra cotta world? 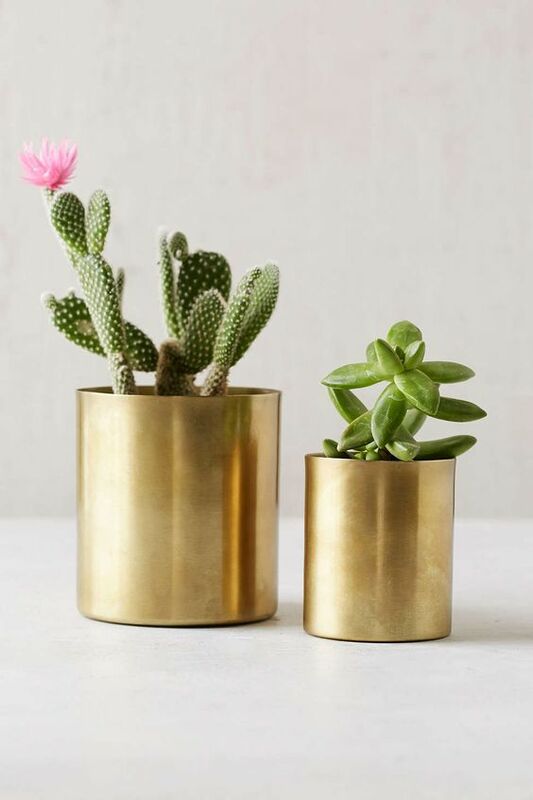 Upgrade your plant holders with gold pots instead. We especially like Anthropologie’s collection and what a cute gift idea! Who wouldn’t like a succulent in a pretty planter? 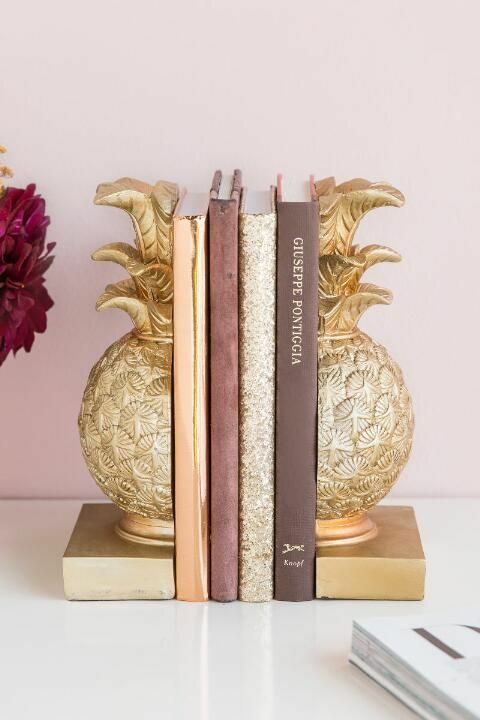 They work perfect in the Prosperity + Wealth section of your home (which loves plants, gold, and green). Now you’re thinking! Another good enhancement for that money center is a lamp, which works as an energizer in a dark corner. 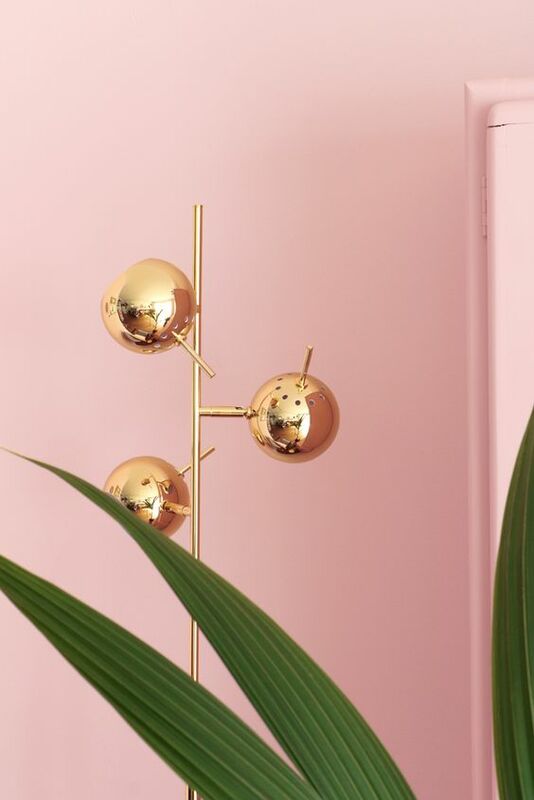 Double the chi impact with a gold desk or standing lamp. We especially love lights that are throwbacks from the 70s, which their round funkiness. A good old can of spray paint can work magic on cheap-o lighting. Find shapes you love and then take care of the color at home. Music Alert! Got to keep friends around with good taste in music. Loving this Francesca Lombardo/ Mattrix remix so much it’s been on repeat. 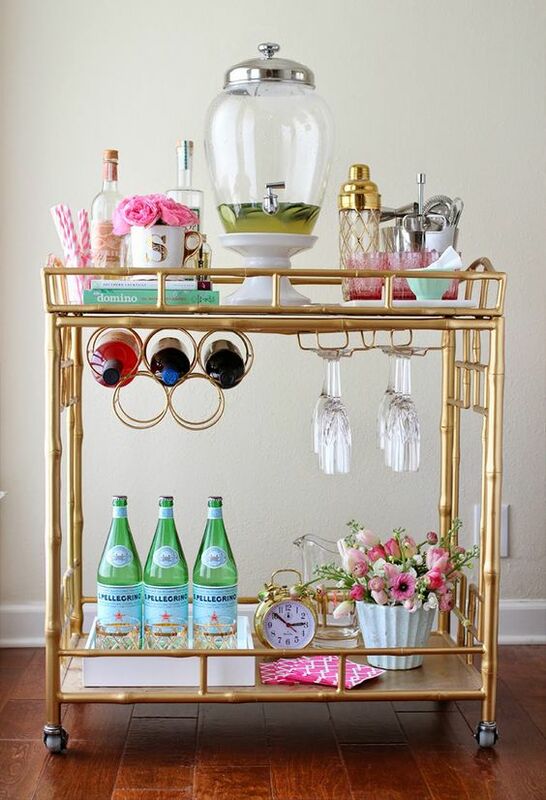 A bar cart can be quite a work horse! 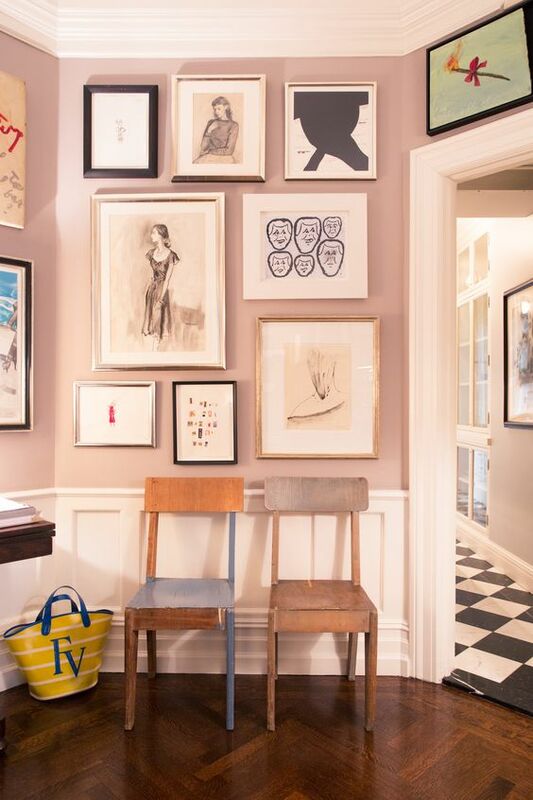 We have been focusing on small corners of the home that can be turned into creative little nooks. One such space would be well-suited for a decked out bar cart, all glamorous and gold. Add golden accessories and treat your guests to a proper cocktail party at home. We like to keep a record player close by, since vinyl just gives the atmosphere something extra special. Don’t you think? Our final suggestion is to hit up your local hardware or craft store and invest in some gold leaf and a can of spray paint. Start looking around your house and see what you could give some attention to. Cabinet or drawer knobs, picture frames, and any old thing can benefit from a royal treatment. When shopping, go big and choose items with ornate carving and thicker frames. We love sticking to the bare necessities, but nothing says they have to be small and frail. Give your home decor a presence!